It's autumn here in Australia and the beautiful fall leaves will soon start dropping in preparation for winter. I’m looking forward to spring, after we get through a cold winter with morning frosts and maybe a light snowfall this year if we’re lucky! In Australia, we know spring is coming when the native Australian wattle trees start to bloom. The sea of yellow along the side of the road brightens a chilly August day. More than 850 species of wattle trees grow in Australia. 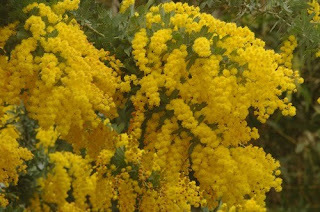 Wattle has adapted to the Australian environment and can be found in every part of the country. It usually flowers from late winter through spring, although some varieties flower at other times during the year. The Golden Wattle is also our national floral emblem and September 1 is National Wattle Day. I have a love-hate relationship with wattle; it looks very pretty but I know my hay fever will kick in as soon as it comes into bloom! 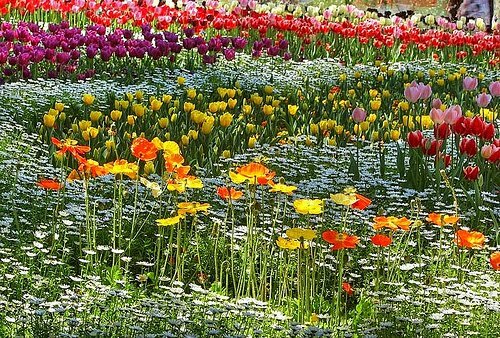 Spring time is all about flowers, and a local tv weather man here in Canberra is determined to keep flowers on our radar all year round. Each night he wears a different flower on his lapel, and tells us about the flower during his weather report. My nose twitches and my eyes start watering when I see him wearing wattle flowers. Canberra (our national capital) is known for tulips. 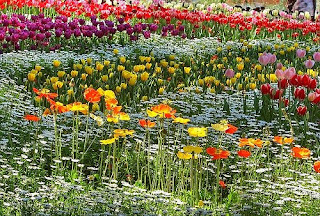 Floriade is a popular flower festival that is held in spring in Commonwealth Park, on the foreshores of Lake Burley Griffin. The flower displays at Floriade are amazing, and it’s so relaxing to wander through Commonwealth Park on a clear spring day admiring the tulips. For those who live in the northern hemisphere, enjoy your gorgeous spring weather. And for those of us in the southern hemisphere, we only have 5 months to wait for spring to return! I've been looking forward to this post for days, Narelle. Very nice and very pretty. Two things come to mind. "note to self" Take antihistamines along if I go to Australia during 'our' fall--your spring. Something tells me the wattle pollen could ruin a nice vacation! A dream vacation, actually. And the words 'chilly August' is pure oxymoron to me! Good reminder of what a big world we live in. I'm so glad Inkwell is an international community. I hate getting stuck in our little American mindset. Narelle, if it's any consolation, it's chilly, dark, and rainy in Virginia today. No walks on the beach for me. I'll be buried in a critique for a friend instead. Great post today. I've been looking forward to it, too. Before I read your entire post, I stopped at the wattle, took off my glasses and leaned closer to the screen so I could see it better. My first thought, it's beautiful. My second thought, it looks like something I'd be terribly allergic to. Remind me that when I make my much dreamed of trip to Australia, not to come when the wattle is blooming. Spring is here, please pass the Benadryl and Kleenex! The tulips are beautiful. We have them here, too, and an annual tulip festival. This year they are also celebrating the world tulip festival. The fields are amazing. I, too, have anticipated this post. Thanks so much, Narelle! Gorgeous flowers in the pics, but I'm fully aware that their beauty can come with a price. I've been taking an antihistamine all season. My car is covered with pollen, blech. But the blossoms, oh the blossoms! My itchy, watery eyes can't get enough of looking at them! It sounds like TV weathermen are often cut from the same cloth, no matter what country they're from. Love the different flower in the lapel every day! Deb, some areas have higher pollen counts than others and I find I have fewer symptoms when I'm in a coastal area with strong sea breezes. I'm getting ready to leave work and go to crit group. Do I have anything done? No. Anyway, I hope I get to visit Australia sometime. I'd love to learn more about what it was like there during England's Regency era. The pics are fabulous and it's so hard to imagine you all going into the fall season. So, allergies and all what is your favorite flower?The Tulip? And Jill, you'll have to visit Sydney, especially 'The Rocks' area (under the Sydney Harbour Bridge approaches near Circular Quay) to learn more about Australia in the early 1800's. The British arrived in 1788 with boat loads of convicts and settled in Sydney. Vivian Stuart, writing as William Stuart Long, wrote a historical Australian series in the 1980's, starting with the voyage of the First Fleet from England in Book 1, which you may find interesting.